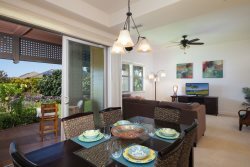 Two story villa located in Waikoloa Beach Villas. Three bedrooms, three full size bathrooms. Full size kitchen, loaded to your heart desire. Full size BBQ kitchen area outside on bottom floor lanai. Upstairs lanai has a view of both Mauna Kea and Mauna Loa. We keep the villa stocked to the comforts of home. Enjoy our bikes and golf clubs to be utilized during your visit to paradise. The resort is a perfect place to explore and enjoy of paradise pleasures. Each bedroom have quality bedding with full size dressers and closets. Cancellation Policy: CANCELLATIONS – Deposits are refundable less a $225.00 handling fee and if deposit is paid by credit card, any applicable credit card processing fees and a non-refundable credit card convenience fee or 3% on Domestic and 4% on Foreign transactions, if cancellation is received at least 61 days prior to your arrival date. For reservations that are during any Holiday period cancellations must be received 121 days prior to your arrival date. For cancellations and/or changes that result in a shortened stay, that are made within 60 days or after of arrival date (121 days during any Holiday), payments will be retained and you will forfeit the full advance payment less damage deposit. Cancellation or early departure does not warrant any refund of rent deposit.